Craniofacial fibrous dysplasia is 1 of 3 types of fibrous dysplasia that can affect the bones of the craniofacial complex, including the mandible and maxilla. Fibrous displasia is a skeletal developmental disorder of the bone-forming mesenchyme that manifests as a defect in osteoblastic differentiation and maturation. It is a lesion of unknown etiology, uncertain pathogenesis, and diverse histopathology. Fibrous dysplasia represents about 2, 5% of all bone tumors and over 7% of all benign tumours. 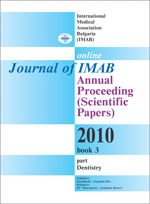 The aim of this article is to represent a rare case of bilateral fibrous dysplasia of the upper and lower jaws, in combination with Intellectual disability (previously called mental retardation). The clinical diagnostic approach including imaging studies: Orthopantomogram (OPG) and 3D tomography is described. Histological examination was also essential for obtaining a definitive diagnosis. Key words: fibrous dysplasia, Lichtenstein-Jaffe’s disease, Maxillofacial, McCune-Albright’s disease, osteodystrophia fibrosa, osteitis fibrosa disseminata, monostotic form, polyostotic form, craniofacial form, cherubism, 3D tomography, Intellectual disability.